Jin’s first kid’s book is done! 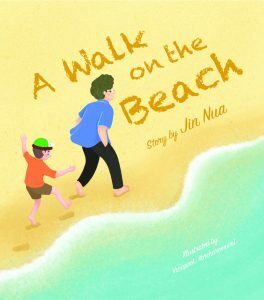 A Walk on the Beach features a fun-filled and insightful day on how the world works–and the young boy’s life is tied to it. It’s back cover says it all. Imagine a perfect day on the beach. Sunny and seventy‚ warm Sand between your toes, the cry of seagulls, and the whooshing of waves. Imagine a father and son. They walk and talk and play and Iaugh. Along the way they discover seashells, sand dunes‚ fractals, and Centerpaths. The World is a wonderful place. lt is our home. Please join Jin Nua as he takes his son on a fun—filled journey across the Sands of time and space to the heart of the Universe. You can purchase A Walk on the Beach on Gumroad at the following link for $2.99. A sampling of A Walk on the Beach can be viewed at the following link (Walk on the Beach Sample).